If you know me at all, it probably won’t surprise you that I have never made jam before. Because I don’t like fruit. 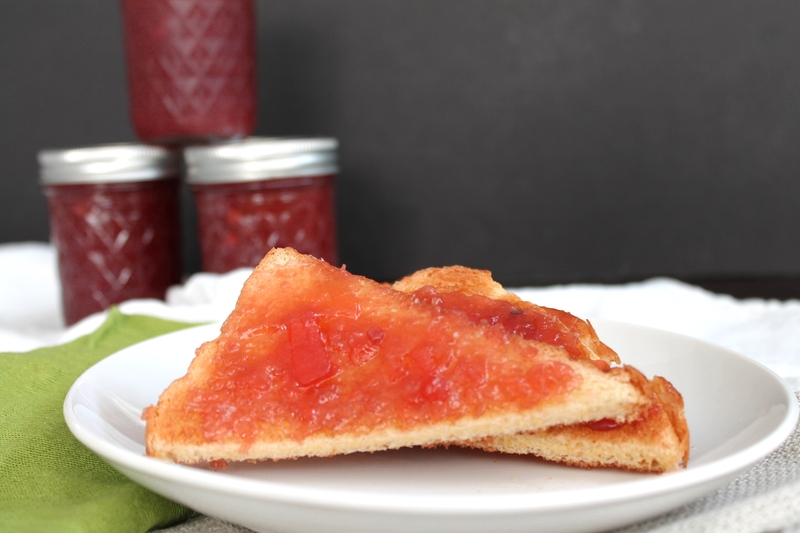 But this rhubarb jam was easy to pull off, and the recipe made a ton! Before you even start making your jam, I want you to do a few steps toward the canning process. First, place a plate in the freezer. You will need this to help you determine whether the jam is set later. 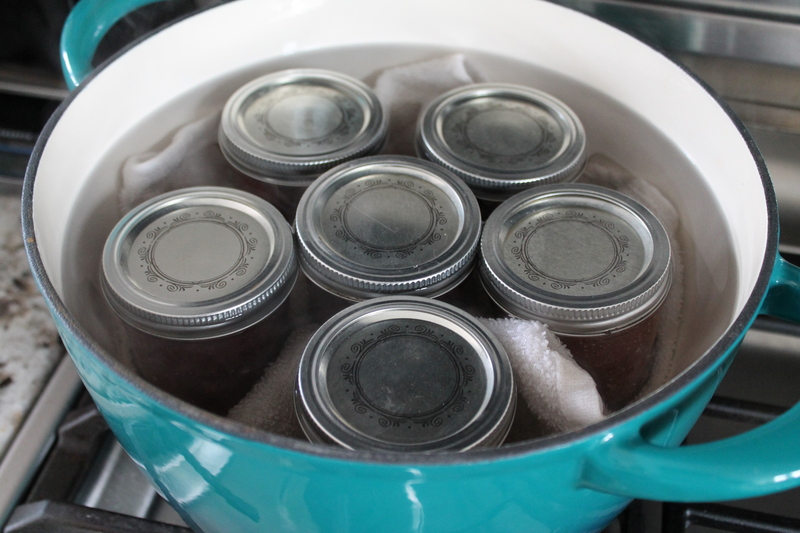 And then, place your canning jars and lids in a large pot and start to warm them. I love how The Pioneer Woman points out that the purpose of this is really just warming (so the jars don’t break when you spoon hot jam into them), rather than sanitizing/killing bacteria (which will be taken care of when you boil the filled jars later). If you do not have canning equipment, that’s okay! I don’t either, and I made it work. Just place a clean towel in the bottom of a Dutch oven, to prevent the jars from cracking against the hard pot, and grab a pair of metal tongs so you will be able to retrieve everything later. This recipe will make six 8oz. jars of jam. 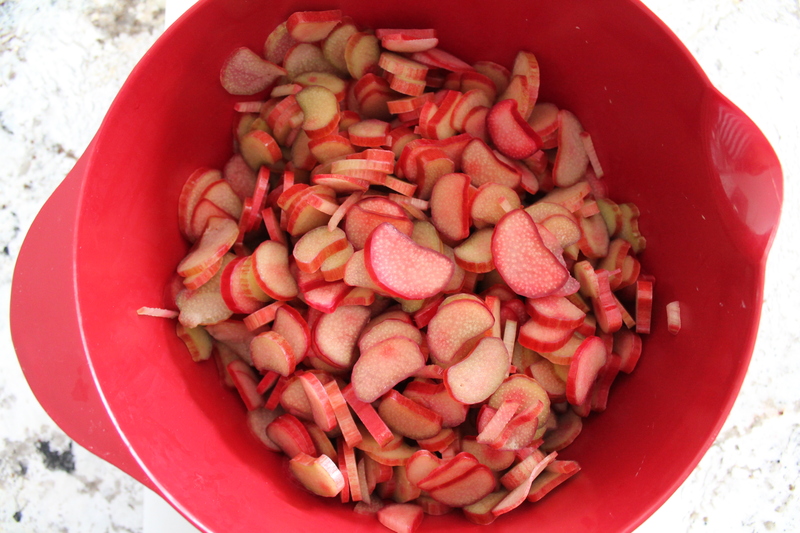 Start by thinly slicing your rhubarb. I always aim for the pinkest rhubarb I can find, but in my area I really have a hard time finding great, ripe rhubarb. And, of course, it is not currently in season where I live. But no matter! Even pale on the inside, the rhubarb still has a distinctive tart flavor, and you can always mitigate the sourness of less ripe stalks by increasing the sugar. The rhubarb I used was fairly huge, and fairly green throughout, but Dave still said the jam was great. He actually agreed that it came out sweeter than he would ideally like, despite the rhubarb being less than fully ripe. That man likes sour flavors. After you slice the rhubarb, shred a large apple (any kind you like: Dave prefers Granny Smith, but you can go really sweet, too). I really do recommend shredding (do as I say, not as I do…), because the apple pieces will not break down very much while you cook the jam, so shredding will help the overall texture of the jam to be less chunky. Toss the rhubarb and apple with sugar, vanilla extract, and warm water. I added a little powdered pectin, which is the chemical naturally produced by most fruits and berries when cooked with sugar, the chemical that allows those fruits to set into a thick jam. 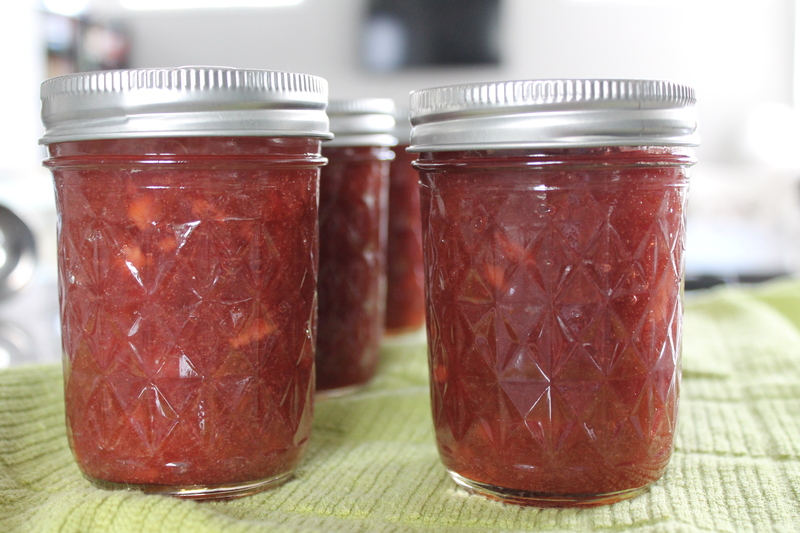 Rhubarb does not naturally produce enough pectin when it breaks down, so it requires a little help to turn into a proper jam. Truth be told, I did quite a lot of reading about jam and pectin before I got started on this project. In Europe, “jam sugar” (which I learned is sugar mixed with powdered pectin) is more widely available, and the original recipe called for a combination of jam sugar and traditional, white sugar. Guess what? Jam sugar is not a thing in the States. 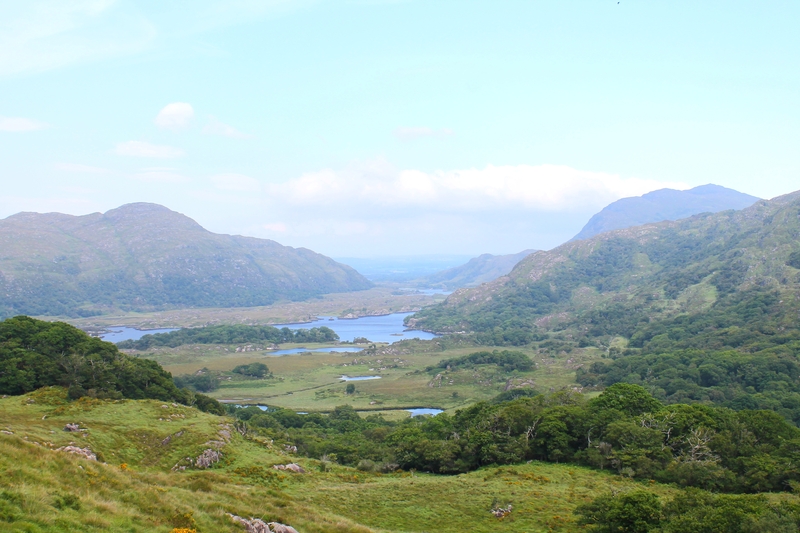 I had a hard time nailing down what proportion of pectin might be mixed into jam sugar in Ireland. 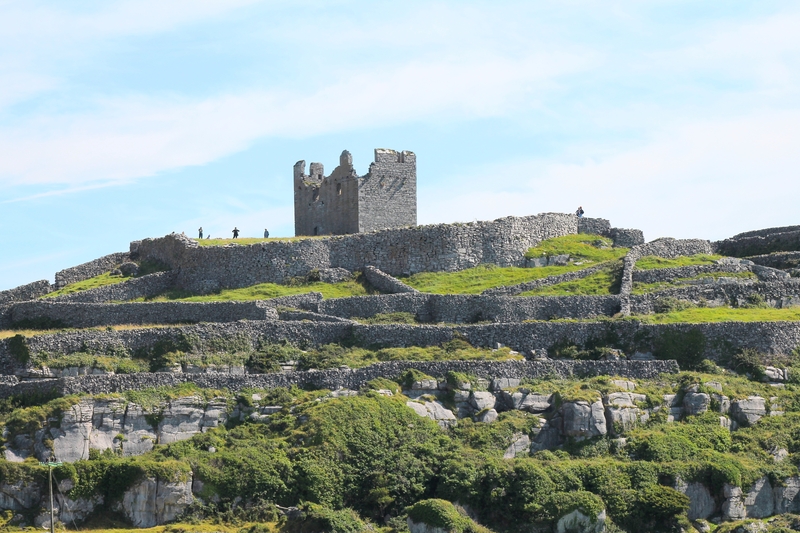 After all of my research, I discovered that I could probably make a soft rhubarb spread without the help of added pectin or jam sugar, but that I would need to get pectin into the mix somehow if I wanted the rhubarb to gel into jam, like the Irish version Dave adored so much. Now, it is possible to make liquid pectin out of apples, which are a high-pectin fruit. There are lots of ways to combine low- and high-pectin fruits when making jam, so that you do not need any extra chemical helpers. You can also add fruit seeds to jams while they are cooking, as lemon and apple seeds are good sources of pectin. 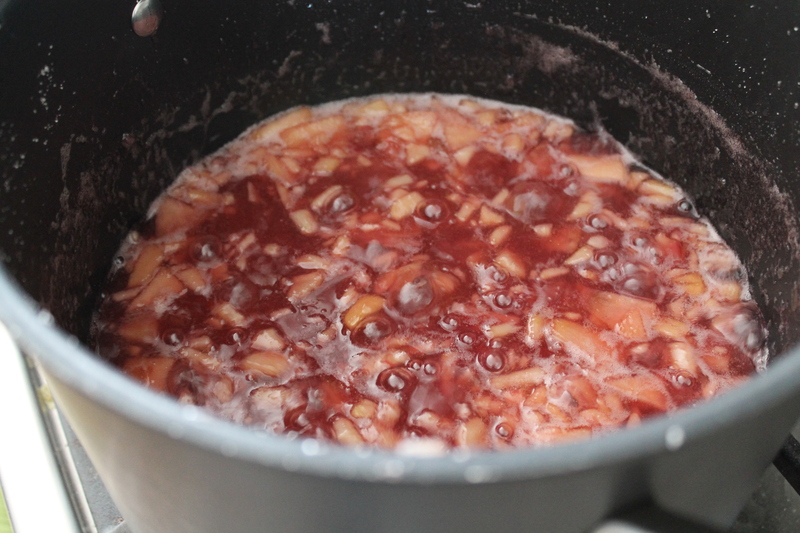 And yes, apples are in this recipe, and they do contribute quite a bit of pectin to help this jam set. 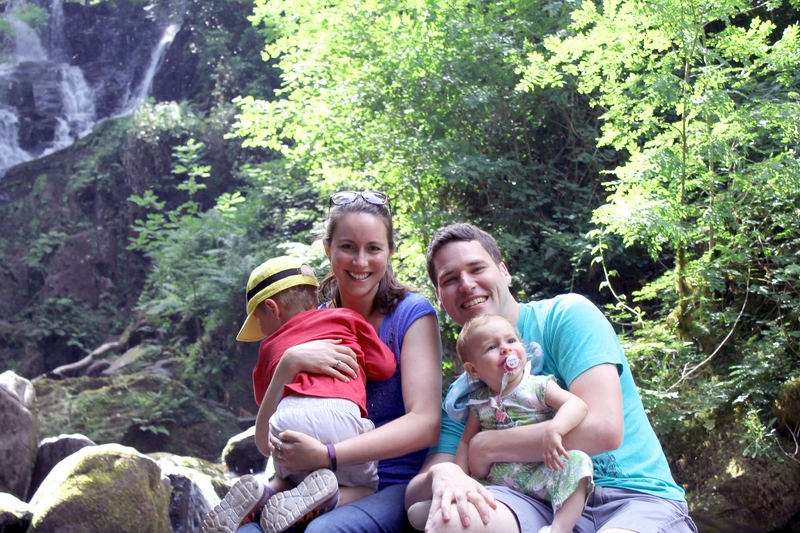 But having never done this before, I just didn’t know if it would be enough on its own. And seriously, all of this sounded like a little more chemistry magic than I was ready for, especially on my first jam-making experience. I wanted an easy recipe that would produce spreadable, not-soggy jam, because I knew Dave would be disappointed by anything else. So I bought a bulk container of pectin on Amazon and used a small bit in the name of texture. The result was perfect, so I’m keeping it. Science. Okay. Back to our rhubarbs. Cook the rhubarb-apple-sugar-pectin-vanilla-water mixture over medium heat until the rhubarb breaks down. You don’t need to stir much during this phase, just give your spoon a twirl around the pan every 5 minutes or so. After about 20 minutes, it will start to look like a thick, dark pink, bubbly stew. Add lemon juice for acidity: this also helps the jam to set. Cook another 15 minutes, stirring fairly regularly. we need that cold plate! Pull the plate out of the freezer and spoon a tiny dollop of the jam mixture onto it. If it holds its shape, rather than spreading or oozing all over the plate, then the jam is set and ready to go! If it doesn’t, give it another few minutes on the heat and then test again. Okay. I am not going to give you a tutorial on canning, because I am not an expert. I am just going to point you to the tutorial I used, by The Pioneer Woman. The basics are: carefully remove the hot jars from the hot water. Fill them within a ¼″ or so of the top, then run a knife around the inside of the jar to release trapped air. Place the lids squarely on top of the jars and very loosely screw the tops on. 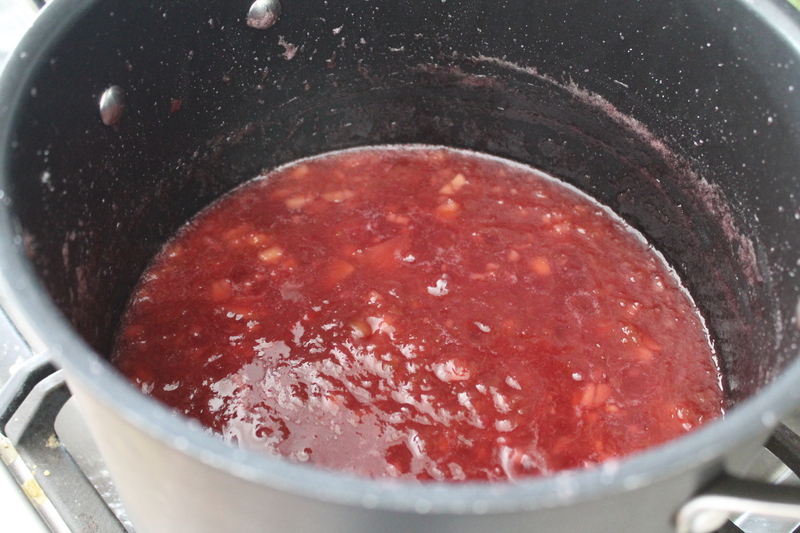 The jam may expand when you place the jars back into the hot water, so don’t overfill or tighten the tops too much. Next, boil the jars for 10 minutes, making sure every jar is completely submersed in the water the entire time. During this time, the lids will begin to seal. Turn off the heat and let the jars hang out in the warm water another 10 minutes before carefully removing them to sit on the counter for 24 hours. During this time the lids will pop and crack as they seal. After 24 hours (or whenever the jam is cool, if you are eager), check the lids of the jars: if there is no give when you press down in the center with your thumb, then the jars have sealed correctly and are safe to be stored at room temperature. If any of the lids did not get an airtight seal (the center of the jar pops when you press it), then you will need to store those jars in the refrigerator. Place a small plate in the freezer. Prepare six 8oz. jam jars for canning (see The Pioneer Woman’s instructions). 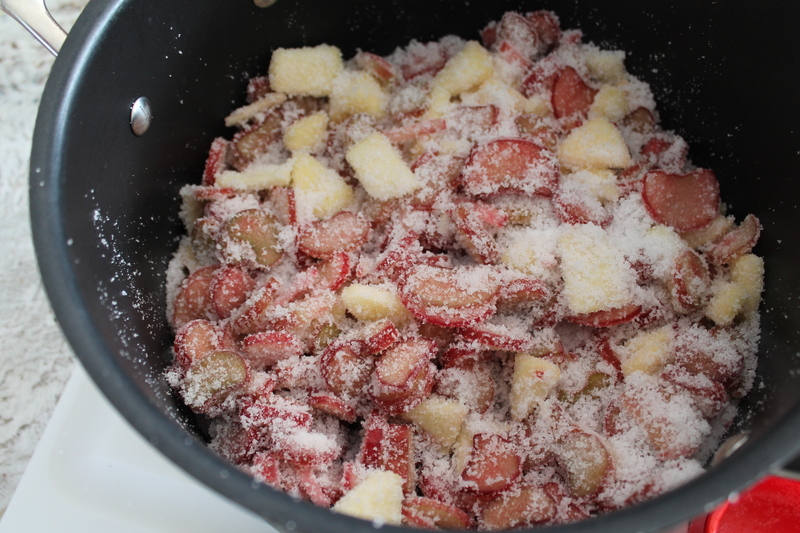 Combine the rhubarb, apple, and sugar in a very large pot. Let macerate for 5 minutes. Stir in the pectin, vanilla extract, and hot water. Cook the rhubarb mixture over medium heat for 20 minutes, stirring occasionally, or until the rhubarb has broken down into a thick, bubbly, red stew. Add the lemon juice and reduce heat to medium low. Stirring regularly, cook another 15–20 minutes. 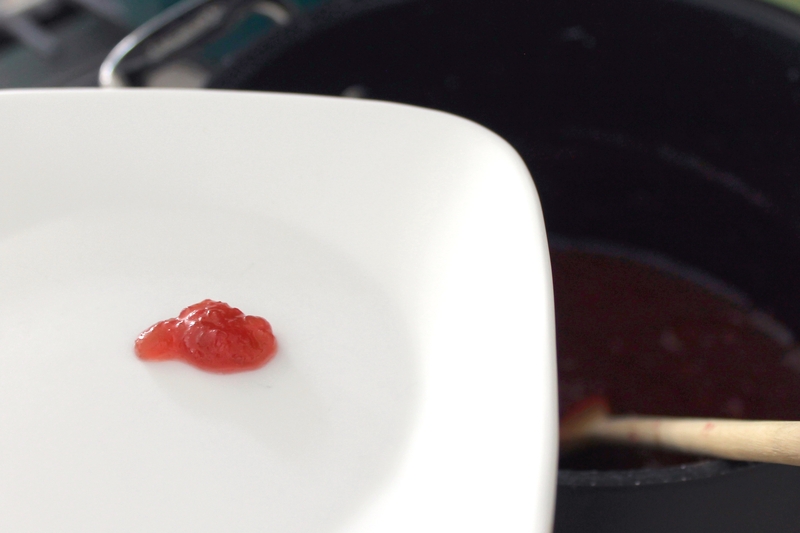 Remove the plate from the freezer and test the jam by dropping a small dollop onto the cold plate. It if holds its shape, then the jam is set. If it runs or pools, cook another 5 minutes and test again. 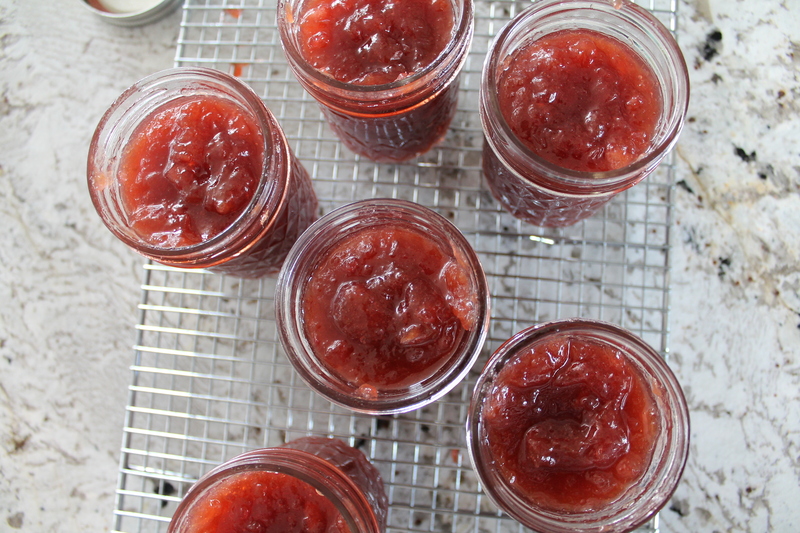 Spoon the jam into warm jars, leaving a ¼″ gap at the top. Run a knife along the inside edge of the jar to release any trapped air. Clean the rim of the jars, then cover squarely with the lids and screw the tops on loosely. Boil the jars in a covered pot for 10 minutes, per The Pioneer Woman’s instructions. Turn off the heat and let the jars rest in the hot water another 10 minutes. Carefully remove the jars from the water and place on a wire rack to cool completely. When the jam is completely cool, test the center of each lid to make sure they are sealed tightly (there should be no give whatsoever). If any of the jars are not tightly sealed, store in the refrigerator; otherwise, store at room temperature until ready to enjoy! 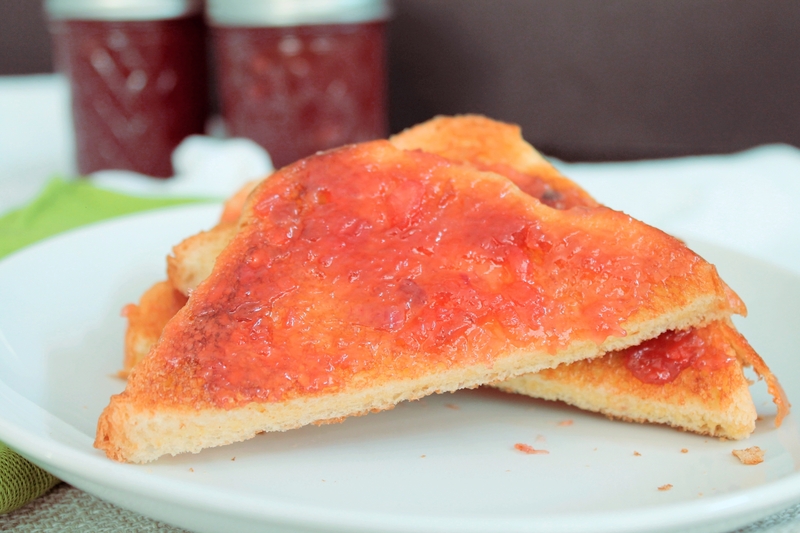 The jam is wonderful on white toast as well as brown bread.